In the wake of a scandal, the Montrose family and their three daughters—Catherine, Lydia, and Emeline—flee Boston for their new country home, Willow Hall. The Witch of Willow Hall is a perfect fall read to me. It’s got just the right amount of thrill and spooky vibes, unlikable but compelling characters, a heroine to root for, and a little dash of romance that you’ll root for. The first few chapters were a little bit of a slow start for me, but it’s a slow start that builds suspense and wonder about the Montrose family backstory and why they’ve had to leave Boston. It’s not solely for one obvious reason or another, and once pieces of Lydia’s story began coming together, I needed to see how everything played out. 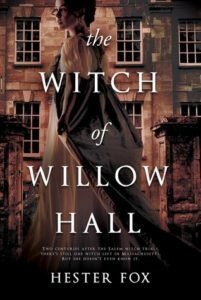 The Witch of Willow Hall is a delightfully gothic story involving witchcraft, forbidden forests, and a large and spooky house holding all sorts of secrets. Fox’s world-building reminded me a lot of Guillermo del Toro’s Crimson Peak in the way it presents the reader with an assumption that soon reveals more truths than initially expected. If you’re looking for a fall read that’s not too spooky but with the right amount of atmosphere, twists, and historical fantasy, then check out The Witch of Willow Hall! I received a digital review copy from Netgalley in exchange for my review. All opinions are my own.